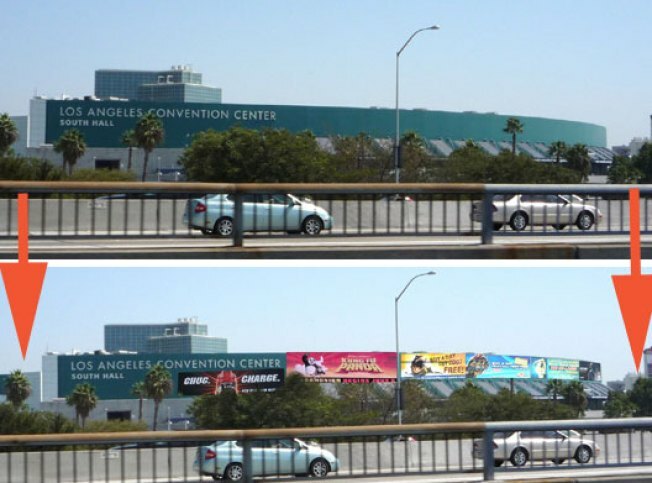 Now that the city's politicians have voted to allow billboards and digital ads on the convention center in downtown, the folks behind the Committee to Ban Billboard Blight have done a little mock-up of what we might expect to see (granted, the city council still has to decide design standards). Kung Fu Panda, anyone? Meanwhile, the Daily News editorial board recently weighed in the politicians' decision to allow the ads--and it's one of the angriest and most emotional editorials we've ever read in the News. Here's an excerpt: "One only needs to take a drive down the city's boulevards - Ventura, Sepulveda, Wilshire - to see that aesthetics, or even logical planning, have been at the bottom of City Hall's list over the years." Basically, the editorial notes the irony in the fact that the city banned fast food in South LA, and smoking in fast farmers' markets, but will disregard "the health of the city." Another excerpt: "To make the deal, though, the council had to disregard its own ban on billboards. It justified it by saying it will bring in a desperately needed $2 million. So, for the sake of a relatively paltry sum to the city's $7 billion general fund, it sold out the skyline."